This is the third female-led major release of early 2019 in the UK and for me it is the most interesting. I thoroughly enjoyed Colette but was underwhelmed by The Favourite (although I recognise the three outstanding performances by the female leads and Sandy Powell’s costumes). But Saoirse Ronan as Mary tops all the others. Margot Robbie is also very good and we are blessed with such an array of powerful female stars in contemporary cinema. At one point in Mary Queen of Scots, Ms Ronan managed to invoke both Deborah Kerr and Maureen O’Hara as an auburn-haired Scots-Irish woman and I can’t think of a better recommendation. It may be because I have only the faintest remembrance of the Mary story from the history books of my childhood that I found this the most engaging of the three narratives about female figures in specific historical contexts. Perhaps right now it is because it speaks to my desperation in Brexit England and a strong feeling that I would rather be in Ireland or Scotland. Mary’s story is about both the Catholic-Protestant struggle in the British Isles and the ‘Auld Alliance’ between France and Scotland, two countries concerned by the nascent imperialist visions of England (though the French angle is dropped too early I think). All of this comes down to the confrontation between the cousins Mary and Elizabeth and the former’s belief that she has the prior claim to be queen in both Scotland and England. It is a story that has been told many times, sometimes by unlikely story-tellers. I’ve tried in the past to watch John Ford’s Mary of Scotland (1936) with Katharine Hepburn as Mary. Ford’s Irish Catholicism naturally backs Mary and by all accounts he was entranced by Hepburn who was well able to spar with him. I’d like to see that again now. There have since been many TV offerings of Mary’s story and at least three more feature films before the current release. In 1940 the biggest star in Nazi cinema, Zarah Leander, played Mary in a German film. In 1971 Vanessa Redgrave was Mary opposite Glenda Jackson as Elizabeth in Charles Jarrot’s film Mary, Queen of Scots and in 2013 Camille Rutherford appeared as Mary in a French-Swiss version of the story. It’s not difficult to see the attraction of the story of an intelligent and passionate woman who finds herself Queen in such difficult circumstances- and sometimes makes unwise decisions. Mary attracts the more romantically-inclined narratives while Elizabeth has often become the focus for the stories of adventure and strength in building up English naval and mercantilist power (though famously also the romantic adventures of Elizabeth and Essex (US 1939)). The two Elizabeth films starring Cate Blanchett in 1998 and 2007 portray Elizabeth in terms of creating the myths of British power. 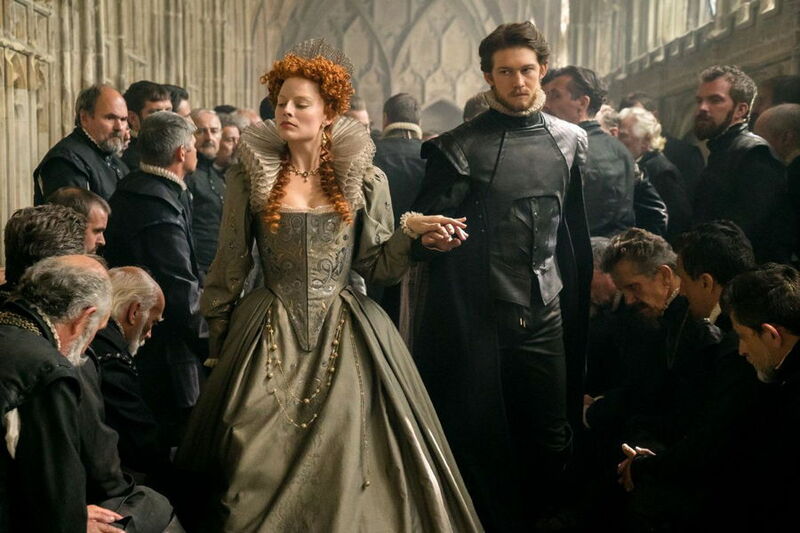 The script for the new film by the American writer Beau Gallimon is based on John Guy’s prizewinning biography My Heart is My Own: the Life of Mary Queen of Scots published in 2004. Guy is a highly-respected historian but this was a book which attempted to dismantle the mythology surrounding Mary and it had its critics. I’m not sure how closely Gallimon sticks to Guy’s ideas, but the film has also been criticised. I’m sure that there are the usual condensings of characters and time-lines but at heart the film tries to stick to historical events apart from its fictional meeting between Elizabeth and Mary. I think there are several interesting elements in this production. I was struck by the use of landscape. Scotland and the North of England are characterised by sweeping long shots of mountains and glens through which Mary and her entourage travel. (See Scottish locations used here.) By contrast, Elizabeth is seen only in her palace in London. John Mathieson as cinematographer has long experience of productions like this, working on Gladiator, Kingdom of Heaven and Robin Hood for Ridley Scott among several other similar titles. 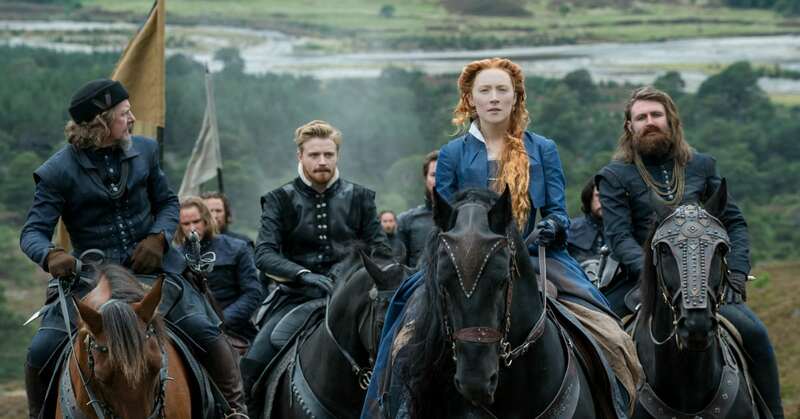 Director Josie Rourke making her first film is a celebrated stage director and I was interested in the settings for Mary’s Holyrood court which seemed to me more intriguing than the stiffness and formality of Elizabeth’s English court. I suspect that Alexandra Byrne’s costumes also work to distinguish the two court settings. Again I felt drawn to the Scots locations rather than Elizabeth’s. The distinction also arises in relation to the question of casting. Several prominent Scots actors are depicted in Holyrood with Martin Compston as Bothwell, James McCardle as Moray, Jack Lowden as Darnley and David Tennant almost unrecognisable as John Knox. Researching this I discovered that the distinction carries through to the more controversial aspect of the casting. At last we have a British film with a significant number of BAME actors in a major historical drama. Some of these are prominent roles such as Adrian Lester as Elizabeth’s Ambassador to Scotland and Gemma Chan as one of her ladies-in-waiting. Others are in smaller roles and here I found the Scottish-Asian actor Kal Sabir. This approach has sadly produced an array of ‘outraged’ IMDb User Comments. Some of these are clearly racist but others suggest a lack of knowledge of British history. There have been ‘people of colour’ living in the UK since at least Roman times. But anyway it doesn’t really matter whether the casting is historically accurate. 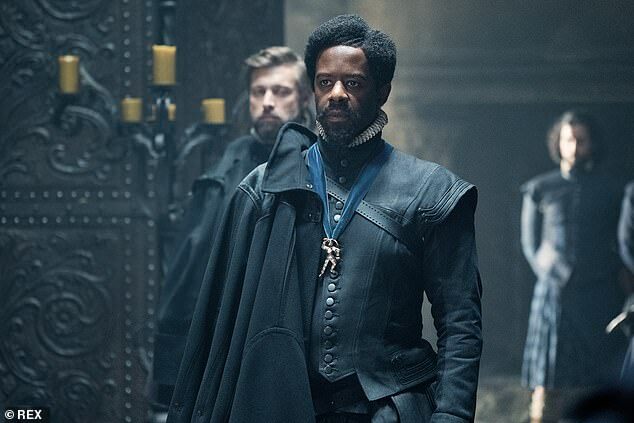 It’s no longer an issue for someone like Adrian Lester to play classical (e.g. Shakespearean) roles on stage so why should it matter on screen? But how has this film gone down in Scotland you might ask? I’m not sure, but checking out the reviews in The Scotsman and the Herald, I found the first lukewarm but the second complimentary and I came across at least one piece wondering why an Irish woman was playing Mary. More intriguing as I thumbed through several reviews was that most of the negative reviews came from men and most of the positive ones came from women. Has Josie Rourke managed to make a film in which women (not just a solitary woman) have significant roles in the history of the British Isles? I’d say yes. I’m hesitant in arguing that Rourke shows aspects of the two monarchs from a clearly female perspective, but it is certainly true that I thought quite a lot about what being a female monarch in the 16th century actually meant and how child-bearing and questions of fertility were so important in the legal/constitutional wrangles over claims to the thrones of England and Scotland during this period. I’ve been a fervent anti-monarchist for as long as I can remember, but thanks to Saoirse Ronan and Josie Rourke this production made me feel for Mary’s predicament. Interesting review. I agree with Roy about the two leads and many of the supporting cast. And the production values are high. Historically the film is less certain; not unusual in this genre. I appreciated his link to locations, but this only shows the castles and lowlands. I am sure some of the mountain backdrops were not the appropriate ones. But overall I found the film episodic which I assume is down to the script. Also seemingly down to the script are frequent parallel cuts between Mary and Elizabeth. I did not think these worked. Partly this was because they are usually so brief. I think there is a tendency in modern films [and you find it in television programmes on cinema] to use short sequences in counterpoint. I find that they do not illustrate what seems to be intended; as if the point should be obvious. In the latter case why make the point?